Nicholas Young’s grandmother Su Yi is on her deathbed. While he rushes to be by her bedside, he’s not the only one. The entire Shang-Young clan has convened from all corners of the globe to stake claim on their matriarch’s massive fortune. With all parties vying to inherit a trophy estate in the heart of Singapore, Nicholas’s childhood home turns into a hotbed of sabotage and scandal. A sweeping novel that takes us from elegantly appointed mansions in Manila to secluded private islands in the Sulu Sea, from a kidnapping at Hong Kong’s most elite private school to a surprise marriage proposal at an Indian palace, caught on camera by the telephoto lenses of paparazzi, Kevin Kwan’s gloriously wicked new novel reveals the long-buried secrets of Asia’s most privileged families and their rich people problems. 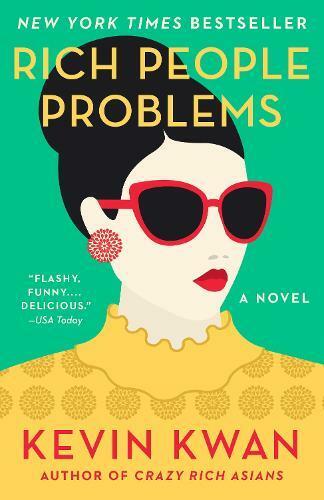 Thwarted love, scheming snobs, obscene wealth and haute couture - it's all here in a fabulous novel about what it means to be young, in love, and gloriously, crazily rich. An absolutely wicked treat! A novel about a family riven by fortune, an ex-wife driven psychotic with jealousy, a battle royal fought through couture gown sabotage, and the heir to one of Asia's greatest fortunes --Amazon.com.